In a story from The Hollywood Reporter, it looks like “The Force Awakens” will have IMAX screenings all to itself in December, as the movie will playing in all of Imax’s large-format screens in North America and other countries. 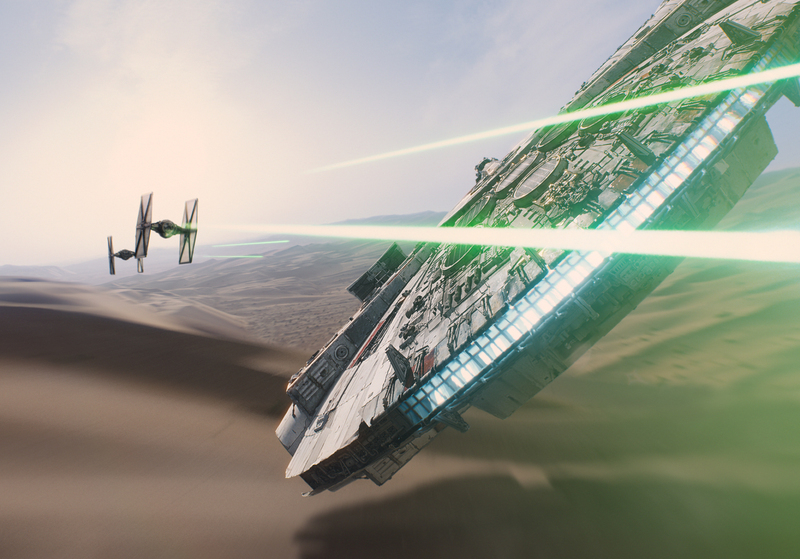 For Star Wars: The Force Awakens, Imax is going big — really big. For the first four weeks of its run, set to begin Dec. 18, J.J. Abrams‘ sequel will have all of Imax’s large-format screens in North America and most of its foreign screens to itself. Imax reserving all of its screens for a single movie for a month is not unprecedented, but it is unusual. The company had a similar deal for the three Hobbit movies, but it struck that pact four years ago and hasn’t made that type of commitment since. In June, Imax broke its own opening-weekend record when Jurassic World leapfrogged over Iron Man 3‘s $28.8 million to grab $44.2 million worldwide — $21 million from 363 domestic screens and $23.2 million from 443 screens abroad. But Disney’s Star Wars could topple that number. It is expected to open on 375 to 400 screens domestically and more than 400 abroad — there’s no exact count yet because Imax tends to install and open theaters in the fall. Domestically, Force will play in the commercial chains such as Regal, AMC and Cinemark that house Imax screens as well as most museums and other sites with Imax theaters (which have played space-related Hollywood fare including Gravity and Interstellar). Although he declines to discuss specifics, Imax Entertainment CEO Greg Foster expresses his confidence in the film, saying, “Star Wars: Episode VII is the ultimate crossover movie — it crosses over to everyone.” A further factor: Abrams, a fan of the format, has filmed a sequence with Imax cameras to take advantage of the oversized screen. Rival distributors have resigned themselves to Force taking over Imax screens — and their premium ticket prices — during the holidays. November releases such as Sony’s Spectre and Lionsgate’s The Hunger Games: Mockingjay — Part 2, which have Imax dates, will wind down by Dec. 18. Warner Bros.’ In the Heart of the Sea, set to open Dec. 11, will get only one week in Imax. Fox’s The Revenant, set to go wide Jan. 8, might get a crack at Imax screens by the Jan. 15 weekend. So far, Imax hasn’t announced any January bookings beyond a Jan. 29 opening for Disney’s The Finest Hours. But if moviegoers really are feeling the force, then Star Wars could dominate Imax screens even beyond that. Definitely some cool news for fans who are going to see “The Force Awakens” on IMAX, because If any movie deserves to have IMAX screenings all to itself, it’s “Star Wars”!